This is the official race report with added extra Deeside content, mostly ramblings but there is some factual content. Lots of thanks, Liz (cramp reliever extraordinaire), Katie (TV team wrangler, factotum exemplar and laid (very) back official photograher) & Sam (THE most exuberant welcomer of runners I have ever seen), the best registration / finish team who also showed how wearing a marshal’s vest can be made more interesting (watch the show to find out!). Jane and Dave for their Derry Lodge duties, all the competitors were very grateful for both aid stations and me for the peace of mind they gave me for that portion of the race. Bob, Hazel & Joe for their sweeping exploits, they got everyone back in good time to watch the prizegiving and to catch the buses. Rich, Jamie, Ian, Ben, Clare, Mark (+ enthusiastic small helper) for kit checks and general assistance & Dave for his help all day and the procuring of the spot prizes from OMM. Lina & boys for both registration and as lead out team to Mar Lodge, I hope you get your bike back Cluan (I think it was you). Roger & Kirsty for the photos and support at Luibeg, great images. Mr Hirst for his sterling, some say Churchillian, send off for the runners. As you can see it takes a lot of folks, who willingly give up their time, to maintain this race, I do appreciate the help tremendously, if I have missed anyone, I apologise, it was rather hectic on the day. From turning up in Braemar at 0730 and forgetting that I had asked for the hall to be opened, triple counting the runners and still get a different number, having a bus crash into me a few miles from Coylumbridge. Consoling an upset “winner” of the race, administering first aid to various runners with cuts, bruises and broken fingers, having to speak with someone’s partner to tell them they had been coptered to Raigmore and not to worry. Having to drive a very, very talkative (she was a lovely quine though) Russian lady runner all the way back to Braemar and finally getting home at 2300. Then waking up on Monday morning and remembering (after looking in the mirror) that I’d neglected the sunscreen, definitely a Scottish tan! What else would I do with a Summer Sunday, until next year…. Finally, I have spoken to Meg (Adventure Show producer) and she is willing to give us a copy of the show, sometime in the Autumn, before it is broadcast. Would anyone fancy a night out, something to eat and a few beers to watch this and maybe the copy Ben has of the previous filming of the event? Let me know and I will see what we can organise. Lairig Ghru 2018 or Some Like it Hot! The Lairig race this year started warm and only got hotter as the country sweltered in a Scottish heatwave, temperatures reached 25C in Aviemore and running through this iconic mountain pass was made even more difficult with a lack of a cooling breeze. We were honoured this year to have The Adventure Show filming the race, we laid on the weather, the enthusiastic competitors and the ever so supportive marshals along with the expertise of the Cairngorm Mountain Rescue team, I am sure the AS team will do the race justice when it is broadcast later this year. Unfortunately Dougie Vipond had a prior engagement at the Royal Highland Show but he assured me he was upset to miss out on running the race!! 214 keen and tense runners toed the line in Braemar and were set on their way by Deeside Runners long standing past president and honourary club member, Dave Hirst who is recovering, very well, from a hip replacement operation he had about 5 weeks ago. In the men’s race the early pace was set by Hamish Battle (Metro) and James Waldie (HBT) as they headed towards the Luibeg burn and the entrance to the Lairig itself, followed by Graham Bee (Inverness Harriers), Jason Kelly (Stonehaven Running Club), Mark Mosgrove (unatt) and George Foster of Keswick AC, indications from just beyond the high point suggested that James had taken the lead and that George was the main challenger with Hamish struggling with a touch of cramp (or maybe more than a touch if you had seen him at the end). These placings persisted until the home stretch in Aviemore itself when James, who had what he described as “a winning lead”, neglected to cross under the railway via the tunnel thus letting George benefit from this navigational aberration and win in a highly respectable, given the weather, 3:18:36 with James appearing a minute and a half later having ran a wee bit further. As the race insists upon the competitor carrying a map and compass and navigation is required, the person crossing the finish line first is the winner but I do have a little sympathy for James, I am sure he will come back stronger for the experience! Hamish hobbled in a further three minutes later looking a little worse for wear but the spread laid on by Kj, Al and the staff at the Mountain Cafe soon had him back to his usual self. A very honourable mention must go to Kieran Cooper, who at 18 years of age must have a bright future in hill running ahead of him, he finished fourth overall in a great time of 3:25:42, he even took money off Duncan from the Adventure Show, who conceived a slightly reckless bet that Kieran wouldn’t break 4 hours! (Kieran, Duncan paid up, I have your £3.50!). Graham Bee rounded out the top 5 finishing strongly in 3:27:10. The male vets race was, as always, keenly contested, Richard Cooper (Kieran’s father) was first, and tenth overall, in a little over 3:40, Peter Jones pipped Brian Bonnyman by 20 seconds for second place, both running 3:52 and change. These three were well clear of the next MV40. The MV50 race was even closer, the inimitable Alan Smith delivered the win, clocking under 4 hours for what seems like the 40th time and winning in 3:57, Willie Rennie had a great race to finish second beating David Weir by about 30 seconds and finishing less than a minute over 4 hours. If success in politics requires stamina then the Lib Dems (other political parties are available) would seem to have a good leader in Willie. The M60 category title was handily retained by Raymond Corbett, almost half an hour ahead of GTM, who was 5 minutes up on Joe Battle, who replicated his son’s third place, despite breaking a finger (he is well named). There was a high quality and very diverse women’s field this year, with international orienteers, triathletes, ultra-runners, as well as the reigning Scottish hill running champion. It was difficult to predict the winner but Tessa Strain (HBT) was keen to emulate husband Murray’s success last year and looked very determined on the start line. At Luibeg, Cat Morrison of Stirling Tri Club had a lead with Tessa not that far behind, and with this year’s Highland Fling winner and Scottish Ultra Trail Champion Rachel Normand (Carnethy) running well it looked like there would be no podium place for Scottish hill running international Steph Provan of the host club, Deeside Runners. Tessa’s strength started to tell and all that hill training she has been doing in Cambridgeshire(!) must have helped tremendously as she powered to an excellent win and 9th place overall in a great time of 3:40:17, fantastic run, this goes to show how good Lucy Colquhoun’s record actually is. Never underestimate the hill runner, Stephanie stuck to her race plan (you probably will do it again!) and ran a commendable 3:54 to take 2nd place ahead of Cat and Rachel, the latter two also breaking four hours by a minute or two. A battle scarred Sally Wallis rounded out the top 5 with an excellent time of 4:05, thus improving the Wallis household record for the race (sorry Dirk, you’ll have to do it again) by around a minute. Tessa was extremely happy to have matched Murray but was more insistent on praising his time from last year, which to my mind was one of the best hill runs of 2017. Double success for the Strain household as Murray finished 8th in the World Long Distance Mountain Running Championships in Poland on the same day. As Cat was on the podium for the overall, Charlotte Black from Shetland AAC was awarded the FV40 prize, she ran well to record a time of 4:31 and finish about 6 minutes ahead of Mary Lye from Carnethy, Ros Baxter from Insch Trail running club took the 3rd place, in well under 5 hours, recording 4:50:09. Deeside were looking for another winner in the ranks and Sarah Dunn duly delivered, in emphatic fashion, running 4:51 and finishing more than 50 minutes ahead of her nearest rival, Mo MacInnes of Garioch Roadrunners, with Judy Leslie rounding out the podium for the FV50’s. Of the rest of the Deeside Runners, Alan Sealy had a very impressive run to record 4:11:38 and 4th MV50, Martin Young ran well for a very creditable 62nd place in 4:38, Peter Henry recorded a 4:41, he didn’t seem to enjoy this one, looked less than enamoured with the race and strolled across the line, you will nail this race one year Peter! Only being 27 or so miles meant that this was a warm up for Jim Savege who finished two places and one minute after Peter, not even the scorchio weather could release the hat from Nick Mardall’s head as he cruised round in a comfy 4:50. Frances Wright ran 5:25 and finished in the top half of the women’s field, a nice effort in the conditions. Two retirals, Sara Henry, who was nursing an existing injury (a real one and not the imaginary ones you tell your rivals about at the start of a race), she started but the injury wouldn’t allow her to finish and Mr Pringle, he has been in good form and I was quietly confident that Stuart would finally crack 4 hours, alas twas not to be, he suffered from empty legs syndrome, a condition that we are all probably familiar with, I see you placing well in the MV40 next year when you go sub 4 Stuart…. Team prizes went to HBT, the heat got to me at this point (you will see the reason on the TV show) and I gave the beer to Stonehaven, sorry HBT! Deeside clinched the ladies prize comprehensively from Carnethy and Insch respectively, with the triumvirate of S’s, Sally, Sarah and Steph all running well. As always, this event cannot take place without the hard work and support of numerous people, thanks to Mar Lodge and Rothiemurchus for providing the access to the estates willingly, to the Mountain Cafe for the fabulous spread, Bremners of Aviemore for getting everyone back home, Braemar/Cairngorm Mountain Sports for the number sponsorship, Braemar Village Hall for the use, Deeside Spring Water for, well, for the water, and Cairngorm Mountain Rescue for providing the hill support. Most of all I would like to thank all my club mates, and others from rival clubs and anyone else I have forgotten to thank, who willingly gave their time to assist in organising the event, without the volunteers these events cannot take place. I am sure all the competitors would agree. The race is run primarily to provide funds for CMRT, this year we had a situation which required a helicopter rescue, the runner involved suffered from heatstroke and was airlifted to Raigmore Hospital where he spent the night under observation and was thankfully released the following day and is fine now. Special thanks to all the runners and marshals who assisted him, especially to Natalya Wallek of Insch Trail Running Club who gave up her race to ensure he was looked after until the chopper arrived, this is what typifies the spirit of hill running. Looking forward to actually seeing the race for a change, if not running it again. This entry was posted in Uncategorized on June 27, 2018 by site_admin. When I agreed to pair up with Bob on the Lowe Alpine Mountain Marathon it was late December and it seemed a long time away. Those six months flew by and before I knew it we were making final plans and preparations for the trip. 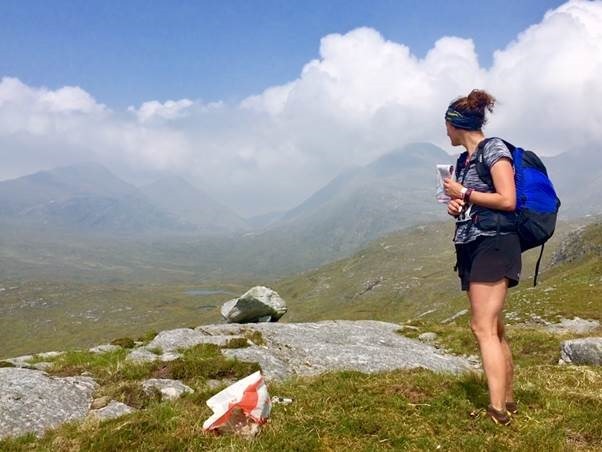 Katie and Bob were experienced Mountain Marathoners but Sam and myself were total novices and the delights of dehydrated foods, blisters and slit trenches were unknown to us. (In case anyone is eating whilst reading this I won’t go into graphic details on slit trenches but it was one of those experiences you only want once ! 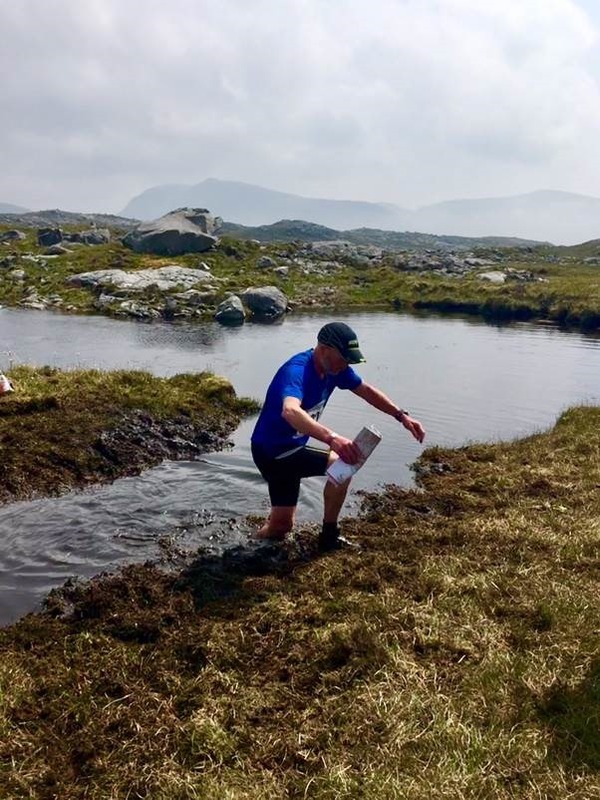 The LAMM is a test of endurance, stamina, teamwork, self sufficiency and navigation and this year was slightly different as the location was made known in advance due to the logistics of getting 700 runners across to the Isle of Harris. It also took place on Friday / Saturday to respect Sunday observance which still exits across the Hebrides. So it was that on a sunny afternoon the Deeside Divas and the Deeside Duo set off from a sunny Deeside to arrive later that evening in an equally sunny Harris. The ferry crossing passed with conversations about which team would finish first and how much Harris gin it would cost the losers … or was it the winners, I never did figure out who was paying. We quickly registered, checked kit again and were off to bed ready for the early start, myself and Bob under canvas with Katie and Sam enjoying the comforts of the VW. The campsite was up early to the sound of the pipes giving time for porridge, coffee, more porridge, another check of kit and then a bit more porridge ! Before we knew it we were on the bus and off to the start –both Deeside pairs were doing the B Class category which only added to the rivalry which became apparent when we got off the bus. Bob and myself took a time to enjoy the views and look at the route checkpoints, whilst the Divas were away, gone, showing us a clean pair of heels. It is fair to say that Harris is stunning and we were blessed with great weather so it was a great feeling setting off on what we knew would be a tough day. Unusually, there had been little rain on the island for a while so it was very dry underfoot, which helped in a lot of ways but I am sure contributed to blisters and foot problems by the end. Have I really run all that way ! The evening was spent performing minor surgical procedures on blistered feet, infection control consisted of a safety pin being held in the flame of a gas stove and the final competitive act of the day was who could fit most compeed on their foot. 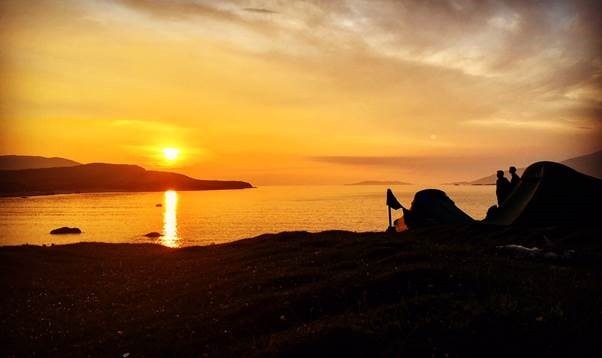 Overnight campsite – not a bad view ! Day two dawned and again the sound of the pipes told us it was time to get up. To my absolute and utter surprise I could walk unaided so with breakfast eaten it was time to start. Despite everything we had both made the chasing start but the Divas were a few minutes in front of us. The day went well, we hit check points and had some interesting competition with teams around us and about 5k to go we caught up with the Divas, the competition was alive and well and truly on. At this point I made a bad tactical error. Katie complained of sore feet so I offered a couple of Ibuprofen. She took them and a couple of shot bloks and when they kicked in the Divas were away never to be seen again. It was at this point Bob and I hit the wall, or more graphically more of a near vertical climb up the hillside. As the Divas skipped their way up we sat down, frequently, only making the top after much effort and sweat. 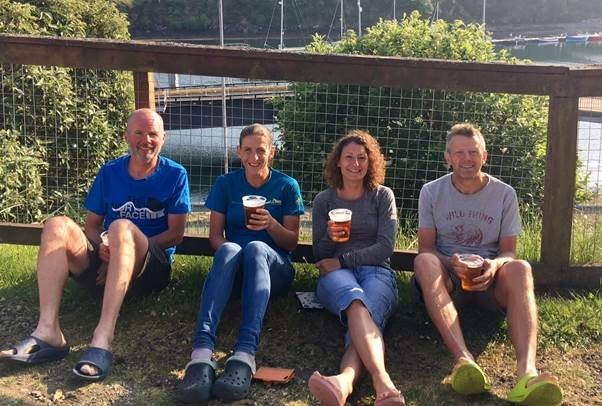 and Sam were busy sunbathing and were quick to remind us they were first finishers – credit where credit is due they were awesomely strong on those final few kilomtetres. And so we had done it – completed the LAMM. The Divas finished 15th ( Day 1 6hrs 36 mins / Day 2 7hrs 34 mins with an overall time of 14 hr 10 mins). On day one we covered 28 k with a height gain of 1600 mtrs and day 2 was 30 k with a height gain of 2000 mtrs. After the prize giving ( which I had to give a miss due to the smell of food from the café making me feel decidedly sick ) we headed off to find a nice cool river in which to was ease aching muscles – anyone watching would have wondered what healing powers were in the water as four apparently incapacitated individuals tried to get in and out of the water. There then followed a pleasant evening in Tarbet, a couple of beers, a big portion of fish and chips and some great conversation reminiscing on two days on Harris. One of the things that struck me was the friendly, social feeling on the LAMM – chatting to people you knew, chatting to some you vaguely knew and chatting to some who you’d never met before. Like minded people sharing experiences and conversations on a pleasant Hebridean evening. Would I do it again ? Well Sam and I have an agreement that if either of us utter a sentence containing the words “ Enter Mountain Marathon” there is a permission to hold them and beat some sense into them ! A hobble on Luskentyre beach on Sunday morning before we caught the ferry back was interspersed with eating plenty to make up some of the calories lost. It was a good excuse to eat anything for the rest of the week. There was a fifth Deesider there as well – Jenny Glass ran with an Edinburgh University colleague and looked glad to have finished but as always, did it with a big smile on her face – well done Jenny. And in the friendly nature of the event it was good to see a good representation from Cosmics including Ian Hamilton who often trains along with us. It only remains for me to thank my three Deeside colleagues for playing their part in a great weekend, especially Bob for his navigation and support at times when I was struggling. The Divas were worthy winners of our informal competition, well deserved congratulations from me ladies. This entry was posted in Uncategorized on June 25, 2018 by site_admin. Cannot believe it was almost 2 months ago! Had really been looking forward to London Marathon 2018 ever since my good for age entry was confirmed last summer. The serious training began in the New Year with the weekly mileage averaging around 50/60 miles per week until last few weeks of tapering in early April. Most of this training was undertaken in pretty miserable wintry weather, at the time I was not to know this would be of minimal benefit during the race! When I arrived in London on Friday afternoon the weather had become tropical in fact it was like being in the Mediterranean! This did not bode well as had not previously run long distances in that heat. I had a feeling this could be a long and tiring day after arriving at the race village in Greenwich Park on Sunday morning dripping in sweat after jogging 2 miles from the hotel. The goal was to finish comfortably inside the 3 hour mark around 2hours 50-55 minutes but that looked a tall order in this heat! Being in the fast good for age entry meant I was fortunate enough to be placed in quite an advanced starting position behind the elite runners so did not have to worry about congestion at the beginning and I set off at a fairly steady pace passing through the 10k point in just under 43 minutes, however even at this early stage was beginning to feel the heat and having to consume more fluids than normal to stay hydrated. I wanted to push on a bit and increase the pace slightly but found this difficult because of the heat and also the sheer volume of runners in front (around 40,000 runner took part!) which meant overtaking someone was not always easy. Consequently, I arrived at the halfway point in just over 1 hour and 29 minutes about 3 minutes slower than had planned. By now it was beginning to feel quite hot so I decided the goal now would be to finish in under 3 hours by following the 3 hour pacer. This approach worked well for a while and I was able to gradually up the tempo but at the same time it also felt like a real strenuous effort to stay in touch with the pacer and I was concerned that I would not be able to sustain this pace until the end. I arrived at the 30k (19 mile) mark, outside the tall buildings of Canary Wharf in 2 hours and 8 minutes still on course to break 3 hours if could run 7 minute miles until the finish but at this point things began to slip. Despite taking on plenty of Water and Gels to maintain hydrated and top up energy levels I felt like the pace was beginning to drop and it was fast becoming a real struggle. It even proved too much for the pacer who dropped off around 22 miles and I never saw him again! As we crossed Tower Bridge for the 2nd time the pace began to drop a bit more rapidly and I realised that the sub 3 hour marathon was looking increasingly unlikely unless I could do something miraculous to reverse the trend! I decided to forget the time and enjoy the last few miles along the Thames Embankment, past Westminster Abbey and Buckingham Palace until the finish at the Mall. Crossing the finish line in 3 hours 4 minutes and 48 seconds I was so exhausted that I could barely stand up! Thankfully St James park was nearby so went and chilled there for a while afterwards along with loads of other marathon runners. It would have been nice to run under 3 hours but the heat certainly took its toll in the end, although at least I managed to fulfil the Good for age entry criteria for next year. London marathon was a really enjoyable experience despite the challenging conditions and it was great to see so many spectators come out and support all the runners involved, its definitely in my plans to return and do it again next year. This entry was posted in Uncategorized on June 12, 2018 by site_admin. James and Steph also put in excellent performances the previous day representing Scotland at the British Mountain Running Championships at Sedburgh. They were part of the mens and womens teams which finished 2nd and 3rd respectively. This entry was posted in Uncategorized on June 6, 2018 by site_admin.